In 2009, DARA was selected by the European Commission’s Humanitarian Aid department to evaluate its humanitarian assistance to Saharawi refugees displaced by the conflict over Western Sahara. The three-month study, between April and June 2009, was the first evaluation of DG ECHO’s support to the Saharawi camps in Tindouf, Algeria, since 2001. The evaluation team assessed the impact of funding decisions between 2006 and 2008, focusing on the validity, effectiveness and efficiency of the food and nutrition, health, shelter, water and sanitation aid provided to more than 150,000 refugees in the camps. The evaluation aimed to advise DG ECHO on priorities, as well as offering them recommendations for improving the impact of its humanitarian response, and to help orientating actions to be funded under the 2009 strategy onwards. The methodology chosen comprised a document review against a structured checklist, as well as semi-structured interviews with focus groups around topic-lists. A total of 157 interviews, both at HQ and field level, were carried out and triangulated with self-conducted as well as pre-existing survey results. The questionnaire covered household food insecurity and dietary diversity, whereas focus group and group interviews concerned health, food and WASH sectors. 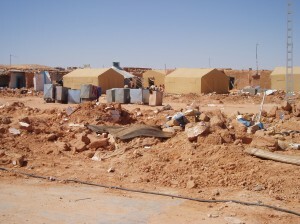 The Saharawi Refugee camps represent a unique protracted and forgotten crisis. They were established in 1976 in the wake of the conflict between the Polisario Front and Morocco. Since then, for over thirty years, between 90,000 and 200,000 people have remained heavily dependent on international aid.